There’s a dish for everyone to love at our family restaurant! Our diverse menu is full of delicious food at affordable prices. 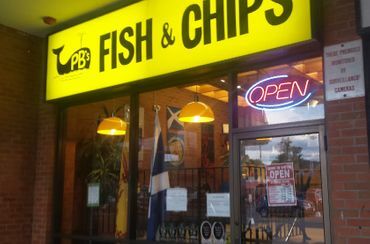 For more than three decades, P.B.’s Fish & Chips has served generations of families with great fish and chips in Durham and the surrounding areas. All the food is prepared to order. The chips are hand cut fresh every day and the recipe for the light, crisp batter is a family secret. Over the years, the menu has grown with the addition of many new items, one being their now famous poutine. After much research, P.B. 's concluded that they could build a better poutine. Layered real cheddar cheese curds, fresh cut chips and great gravy proved to be a grand success. Hungry for some fresh seafood? 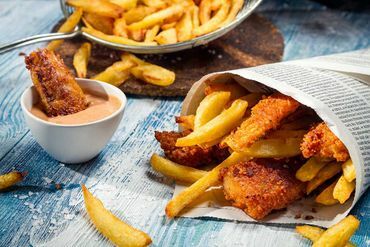 Visit P.B.’s Fish & Chips soon! Take a look at all of the tasty choices! Come for seafood in Oshawa. Thinking of grabbing take-out? We offer delivery and pick-up! Check out our social media page to keep up-to-date with specials.